Hey everyone! Hope you are all well! I can't believe it's the last day of August! How quickly has this month gone? It's madness. I can't believe I've been at my job for just over two months. It's absolutely flown by but I am absolutely loving it and I know that I've picked the right path for me. Anyway, I thought I would end August on my blog by doing sharing all the non beauty things that I've been loving as I love reading these types of posts and watching this type of video on youtube and I know others are the same so let's get started. The first thing I've been loving has been the TV show Smash. If you didn't already know I love musicals and musical theater and anything related to that so when a friend introduced this show to me a couple of years ago now I absolutely fell in love with it. I love the music, the characters and I find it can be a real eyeopener to what the industry is like and what it takes to get into it. It's brilliant and I would highly recommend it. I've also really been loving the film If I Stay this month. I didn't photograph it because I don't have a physical copy of the film I just watched it on Sky but it's amazing. I had read the book in the past and absolutely loved it but the film really did impress me. I loved the characters and the actors who played them. It basically follows the story of two young teenagers who fall in love through a mutual love of music but who face struggles along the way. It's definitely a weepy though but again I'd highly recommend this. If you have been reading my blog for a while or following me on twitter even then you will know I absolutely love books. I can't walk into a bookshop and not come out with anything. I absolutely have to have something. The loved Zoella mentioned this in her July Favorites video and when she spoke about this I know it was something I had to read. The book is called All The Bright Places by Jennifer Niven and I think it's amazing. Again it follows the life of two teens who fall in love however it's also an incredible book for the awareness of mental illness. Definitely one to pick up. Earlier this month I went to Primark and when I was at the checkout I spotted a Portable Phone Charger next to the till. I decided to purchase that as well and I'm so glad I did. It's honestly the best portable charger I have. I am constantly on my phone whether it's blogging, playing games, on twitter or just texting, I'm always on it so it constantly runs out of charge however this little beauty has definitely been a life saver. You can get two full charges from this which is pretty amazing. Especially as it's from Primark! I love it. 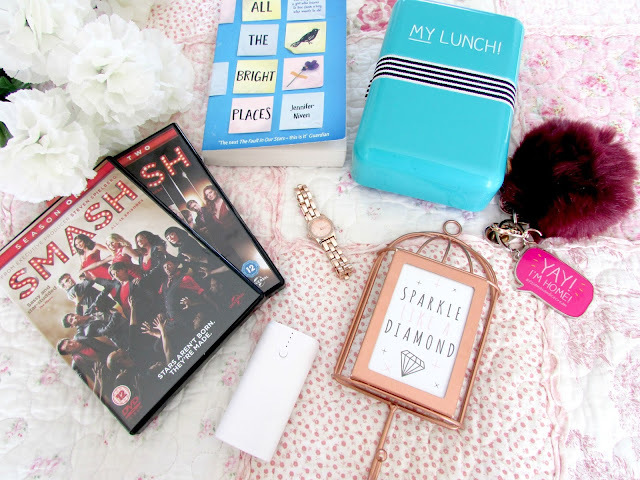 If you didn't already know the lovely Gabriella from VelvetGh0st on youtube released a LIMITED EDITION home range in Primark and I couldn't resist picking up a few bits and pieces but one of my favorites has definitely been this Sparkle Like A Diamond Hook. I've been using this for my keys and I have found it has come incredibly useful. I absolutely love the rose gold design on it too! Grab it whilst you can folks! Like I've mentioned it's only limited edition but would make a great addition to a bedroom/hallway. Happy Jackson is a brand I came across late last year and I absolutely adore it. All their products are so happy and fun so when I spotted this lunchbox in a little shop on Oxford Street I made no hesitation in picking it up. I love the colour and I love the fact it gets straight to the point on the box. I've been making packed lunches most days for work since buying this and I just love it so much. If you haven't checked out this brand before I'd highly recommend it. Another thing I picked up from the brand Happy Jackson was this adorable Key chain that says 'Yay! I'm home #pyjamasandicecreamtime'. I just think it's so cute and I absolutely love the brightness of it all. It's just so adorable. Another key chain I got was this adorable burgundy ball of fur that I bought from New Look. Bit of a random purchase but I absolutely love it and think the color is perfect for autumn. It's so easy now to just go in my bag and whip out my keys as I know exactly where they are! I've also really been loving this incredibly beautiful gold watch that I bought in Peacocks. It looks so pretty on the wrist and has gorgeous little diamonds around the face which adds a really pretty girly touch to it. At work we can only have silver and gold watches so I think this makes a perfect addition to my uniform. I just love it! The final thing I've been loving this month has been my brand new Pipdig Blog Design. I absolutely loved my old design but wanted things to look a bit more fresh and professional on my blog and I think this design does the trick and I been getting a lot of positive feedback and lovely messages from those of you who read my blog regularly so thank you so much. The guys from Pipdig were absolutely amazing so if you're looking for a new blog design I would highly recommend them. So those were all my random favourites of this month. I hope you enjoyed reading this post just as I enjoyed writing it. I'm so sorry that I've been extremely quite on my blog lately. I've been doing so much overtime at work and been so busy that I just haven't had time. However I'm getting back into the swing of things and becoming a lot more organised so you'll be hearing from me a lot more in September. If you have done a post like this, this month make sure to leave it below as I think it's a great way of finding out more about other people. What have been your non-beauty favorites throughout August? I'd love to get some bits from Gabby's Primark range, but there isn't a store near me that stocks it :( I really wish I could get some!!! I'm very jealous!!! I love non-beauty favorites! I also really like your pictures used. I haven't seen if I stay yet (I've just read the book), but am kind of avoiding the movie because it's a sad story to watch. Oh wow, I love the sound of "All the bright places" - I'll give it a go! 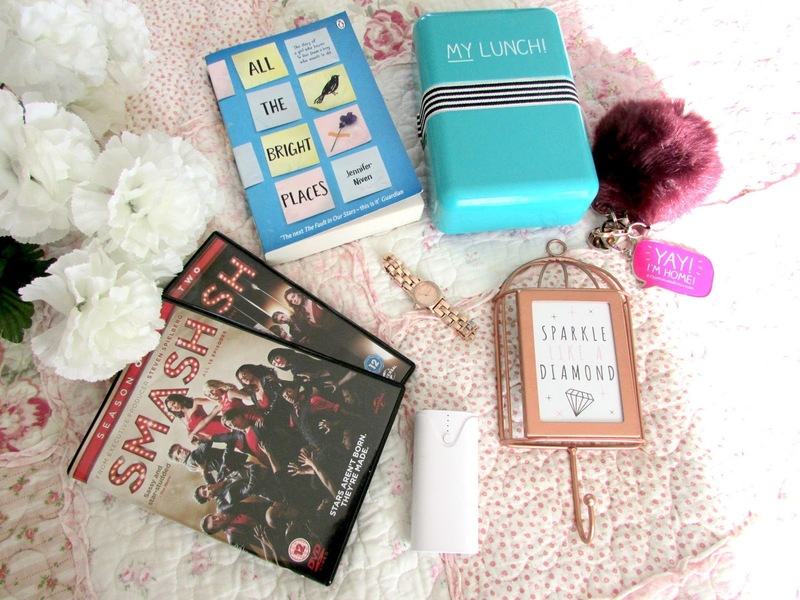 That lunchbox and those keychains are so adorable! I really want a fluffy ball keychain to attach to my purses for the colder seasons.